Prosper’s visibility index (blue line) is much higher than Lendingclub’s. Prosper.com ranks good for more and more important keywords in organic search rankings. Organic search means, that Prosper shows in a the search results at search engines that are not paid ads. But which search terms do the actually rank for? 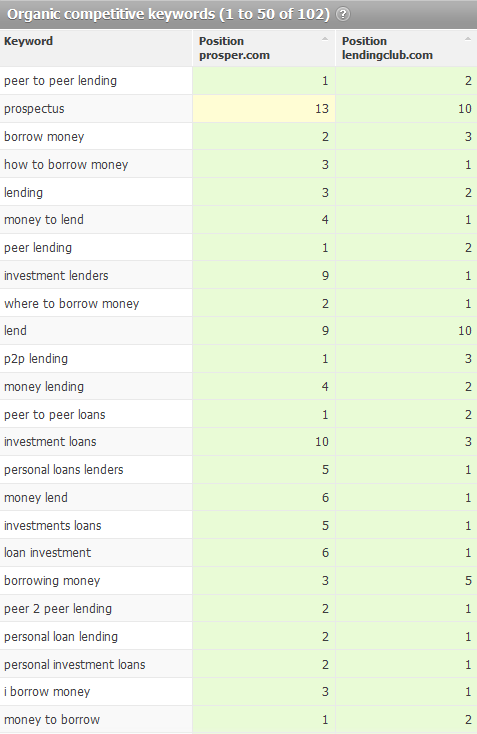 The following table is a snapshot how Lending Club and Prosper rank for selected keywords (for searches done in the US). It can be seen that often the difference is minor with one taking first place in search results and the other ranked second. How do Prosper and Lending compare in SEA? SEA or serach engine marketing is the paid placement in search engine result displays. At Google this is called Google Adwords and placed above and on the right of the organic search results. Analysing activity here, P2P-Banking.com found that during the past two years Lending Club (green line in chart below) had a higher SEA visibility index than Prosper for most of the time. A very rough (and unreliable) estimate put the ad spendings of Lending Club for its SEA campaign at above 50,000 US$ per month. 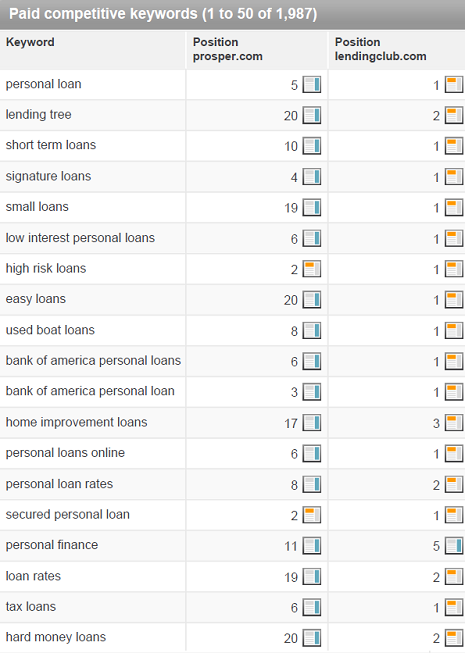 What are the main keywords Prosper and Lending Club are targeting in SEA campaigns? Lendingclub in many cases bidded much higher CPCs to have the ad placed at the top position. 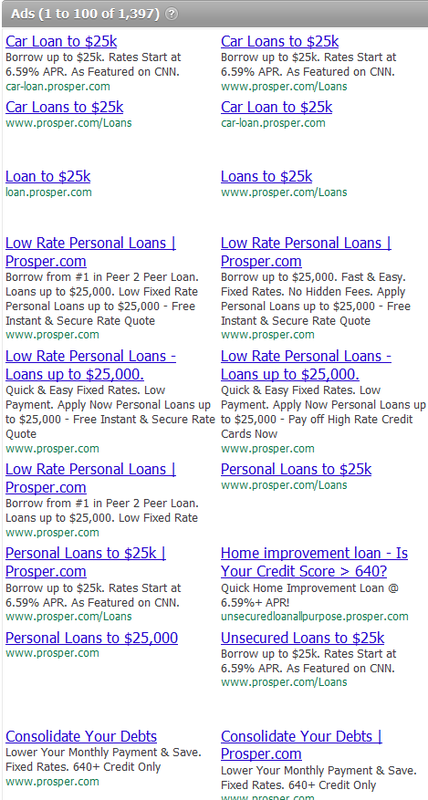 What ad texts are Prosper and LendingClub using in their search engine marketing? 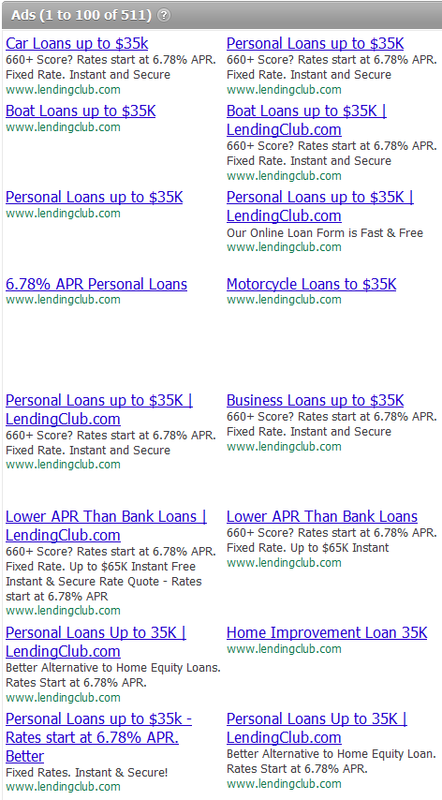 Since both prominently use the maximum loan amount in their ad copy and the ads ran next to each other for many keywords, I do wonder if Lending Club ended up with an over proportional number of loans between 25K and 35K US$?